﻿ What Makes Black Steel Water Pipe Beat Other Pipes? What Makes Black Steel Water Pipe Beat Other Pipes? Water is the essential for our life and they are transported through pipeline. Based on this point, water pipes are needed in great quantities. Therefore, they must be made from inexpensive and durable material. It should be easily installed and repaired. Only metals can meet the above requirements. One of the most widely used materials is black steel pipe because of its advantages. For those water of high quality, usually for human consumption, is usually transported by black steel pipe because this this transporting can keep the water's quality by preventing the inner surface from rust and corrosion. Black steel pipe is the most used material for water transportation among cement, plastic and metal pipelines because it can transport large quantity of water through long distance especially for where the pumping systems require high pressure. Black steel pipe can have a longer lifespan than those made from other material and ensure more qualified water which is the most important aspect. A water pipe system contains large amount of pipe, therefore a little damage or pollution can let to a serious consequence and affect hundreds of thousands of people's life. Before black steel pipe come into use, copper has been used for many years to transport drinking water to taps. But it is questioned because people afraid the copper may permeate into the water. Although humans can absorb reasonable amount of copper, too much copper can do harm to people's health. And studies show that black steel pipe is comparatively better than copper pipe. Black steel pipes are relatively expensive than other pipes, but it worth because they have the most powerful and durable ability of all water pipes. They can endure high water pressure, transport longer distance than many other materials and require lesser expense in installation. Except this, the water pressure required in the inner pipe is strict to make sure less leakage and contamination during the delivery. 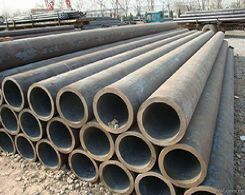 Black steel pipes for water transportation can be used for different methods to prevent corrosion according to inner surface condition and external environment. There are mainly two points that make black steel pipes outweigh other pipes. First of all, flow efficiency. One of the main purposes of transporting water is economy. Supplying water without interruption is very important. The quality of water pipe is very important because a leaking can bring about water waste and affect end-user's normal use, cause great loss. And the efficiency of water pipe depends on the volume of water in a specified time. Different materials have different degree of friction which can reduce water flow. Black steel pipe have lower friction thus the total volume delivered is larger. Second is water pollution. Once the pipe is corroded, the whole water pipeline can suffer from it. Therefore, the water pipe should prevent rust and corrosion. Water pipe that made from other material can infiltrate into the drinking water can result in health problem. 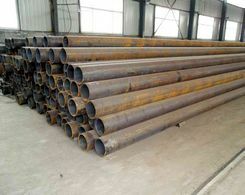 Black steel pipe has great ability to resist rust and corrosion can reduce chances of pollution. With many advantages over water transportation, black steel pipe beat other pipes easily! The welded steel pipe and API steel pipe are also available. Prev:Why We Use Seamless Steel Pipes?